If our blog and interview with Alan Rowan have got you motivated to explore the mountain ranges in Scotland, why not head to the Five Sisters of Kintail where you can do three Munros in one go! Climbing the Munros may sound like a mean feat but the views alone make it worth it, regardless of the season and time of day (or night)! 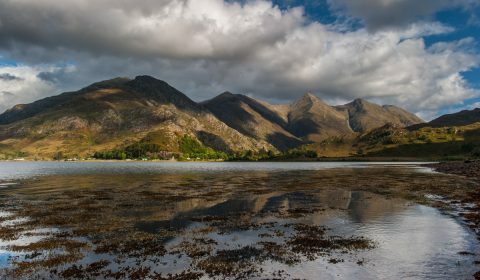 One option for embarking on your #MunroMission can be to take the ranger-led Five Sisters of Kintail guided walk. The views of this site here were used in a SKY HD advert so they must be good! On your walk the ranger will provide lots of stories and information about the flora and fauna you see on the way (however, our rangers haven’t caught on to the midnight expeditions just yet!). This walk incorporates three Munros! 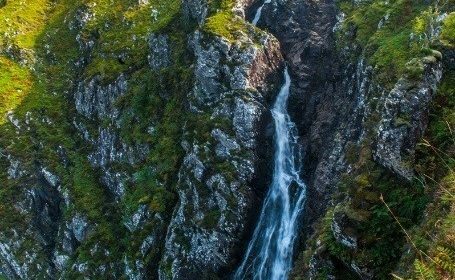 But if that’s too ambitious our Rangers at the Trust can offer several other guided walks including to the Falls of Glomach, a 370 ft single drop waterfall high in the mountains. Keep your eyes peeled for red deer and golden eagles during your expedition! The rangers even run courses and trips suitable for all which provide stunning views of the coastal areas at Kintail. The ranger’s work doesn’t end at the Five Sisters, they are placed all over Scotland doing vital work toward the maintenance and conservation of the Trust’s 190,000 acres of wild land, islands, mountains, and coastline. 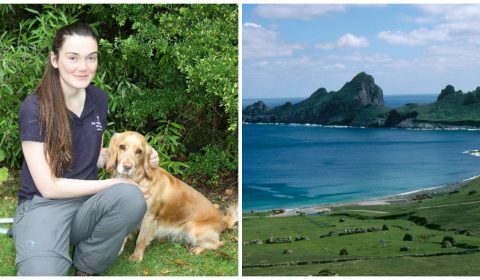 The Trust appointed its first Countryside Ranger Apprentice in November 2015, Kirsten Dallas, and we have been lucky enough to interview her while she is currently situated on St Kilda. NTSUSA: You are currently based on the archipelago of St Kilda, what brings you there? KD: I am very lucky to be able to spend some time here in St Kilda. There was need for some temporary ranger cover here and we were able to fit it in as part of the apprenticeship. I meet the visitors to the island, help look after the site and ensure the important biosecurity rules are followed. I am absolutely loving my time here. NTSUSA: One of the most recent campaigns for the Trust was the #loveourislands campaign with a particular focus on St Kilda, it was also a blog here at the Foundation, can you imagine how life would have been for the islanders all those years ago now that you are based there? KD: It is amazing to walk through the village and wander into the houses. You really do get a strong feeling of the history here and can picture all the stories you have read about. It certainly would have been a hard life making sure there was enough food and getting through the winter storms, but you can also sense that there would have been many very happy times within the close community. With St Kilda, the more you find out the more you want to know. There are always more questions and this place certainly still holds a lot of secrets. NTSUSA: There has been a decline in the profession and skilled personnel of Countryside Rangers, why do you think that is and what can be done to encourage future generations? KD: I don’t think there has been any reduction in the amount of people wanting to become a ranger, if anything I suspect there are more and more people interested in the profession. I think the problem is that there just aren’t many opportunities out there to find work as a ranger. Ranger jobs seem to have been hit quite hard by the lack of funding around over the last few years. I think we just need to encourage young people who would like to be a ranger to go for it and maybe start with some volunteering. Once you have done some networking and have some work experience you will be in a good position to find the jobs. NTSUSA: What motivated and inspired you to become a countryside ranger and how did you get involved with the program at the Trust? KD: I grew up in the countryside and always spent my days exploring outdoors. I studied Geology and Physical Geography at university and knew by the end of my degree I would enjoy working outdoors in the Scottish countryside. I went and volunteered at the NTS Balmacara Estate to try out ranger work and loved every second of my time there, especially the variety of the work. Things have snowballed from there as I picked up a seasonal ranger job at Balmacara and the experiences I had gained through that set me up perfectly for applying to the NTS Ranger Apprenticeship. NTSUSA: What does the training process for this program involve and what is your preferred area of focus? KD: Over the 18 months of the apprenticeship I am working towards the Scottish Countryside Rangers Association Ranger Award. This is a continual personal development program that I collect evidence for from my work with the NTS. The award covers a huge variety of skills such as habitat management, running survey work and communicating with the public. I also get to attend training courses and work towards other qualifications, for example I recently attended a wild flower ID course and I gained my chainsaw qualification earlier in the year. I particularly enjoy working with the public and the hands on work such as building footpaths, but I love the variety that ranger work brings. NTSUSA: Can you tell us about the program “Nature Nippers” that you are currently developing? KD: Nature Nippers is a nature activities club for children under 5. A number of NTS Ranger Services have Nature Nippers clubs so we wanted to host a group in the North East where the apprenticeship was first based. The sessions have proven to be very popular and the first couple of events have gone really well. The children join us for an hour of outdoors nature activities where they are encouraged to get hands-on and explore the Crathes Castle wildlife garden for themselves. Our first session was all about seeds and the children planted some seeds in the garden and also took some cress seeds home to watch them grow. It is so nice to see young children getting out and about in nature and we hope that it sparks and interest they keep as they grow up. NTSUSA: How have you found talking to the Highland Youth Parliament and are the groups you talk to aware of all the work the Trust does? KD: I had the opportunity to speak to the Highland Youth Parliament about the Ranger Apprenticeship and the route I had taken to get it. It was great to get a chance to let young people know about the Ranger Apprenticeship as a possible option for their futures and also to tell them about the wider work the trust does. Much like most of the groups I have spoken to, they were very surprised by the extent of our work on the countryside properties. NTSUSA: What countryside property of the Trust are you most excited about and why? KD: St Kilda is definitely pretty exciting! There is just so much to take in here from both the historical and natural perspective. I also love the West Coast properties. Balmacara was a very special place to spend some time and its NTS neighbours at Kintail and Torridon are some of my favourite places for their spectacular mountains. NTSUSA: How important is the work of the trust and the funding for further establishing the program? KD: It can be very difficult to make the jump from volunteering into the ranger jobs so starting up the Ranger Apprenticeship is a really positive step from the NTS to support the next generation of countryside rangers. I understand the aim would be to have several Ranger Apprentices across the NTS so I really hope we can continue to find the funding to allow other people to have this amazing opportunity in the future. There is no other organization offering training to aspiring young rangers, and the usual way of entering the profession–via seasonal positions–is rapidly declining. The Trust has the opportunity to fill this gap and take a leading role in developing a future generation of Countryside Rangers and their profession across Scotland. Based at Crathes Castle and Estate in Aberdeenshire, this program will provide trainees with a unique opportunity to develop the vital skills and knowledge necessary for a career as a Ranger. The cost of training one apprentice totals $50,000 per year, including protective clothing, equipment, and hands-on experience in the field.